Not many Americans have been able to make a mark in the game of soccer, but one name which truly stands out is that of Landon Donovan. Donovan is regarded as the Greatest American Soccer player of all times. He played as a midfielder during most of his career, including stints for the US soccer team and the LA Galaxy team. It’s a shame that a player of Donovan’s caliber ended up retiring early – at the age of 34 – due to lagging injuries. He did however go having firmly established himself as America’s greatest ever soccer player. 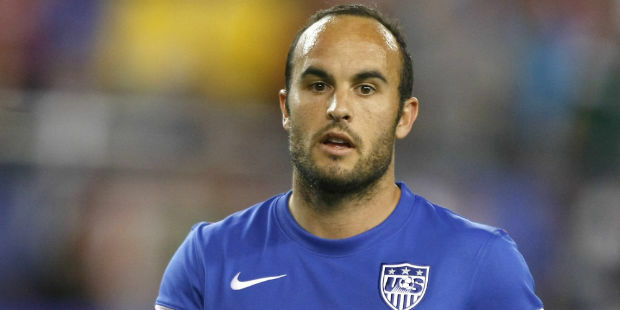 Landon Timothy Donovan was born in March 1982 in Ontario, Canada. Donovan first began playing soccer at the age of six with his brother and actively played for his high school’s soccer team. In 1999 Donovan attended the IMG Academy and was soon part of the US U-17 soccer team. Later on Donovan signed on with Bundesliga side Bayer 04 Leverkusen where he made 28 appearances and scored nine goals before being loaned in 2001 to the San Jose Earthquakes. The same year Donovan recorded seven goals and 10 assists for the Earthquakes while leading San Jose to their first-ever MLS Cup. In 2003, his 12 goals and seven assists led the Earthquakes to its second MLS Cup victory, where Donovan earned his first MLS Cup MVP honors. Donovan was known for his versatile attacking pace and stamina as well as intelligence and technical skill. Donovan remains LA Galaxy’s all-time leading scorer and the best player in MLS history. When he first joined the LA Galaxy he went on to score 12 goals and add 10 assists, leading the club to an MLS Cup victory that year, and his third MLS Cup championship in five years. He remained with the Galaxy and became the club’s all-time leader in goals – 112 and assists – 107. Donovan led the Galaxy to some of its highest achievements, including four MLS Cups, two Supporters’ Shields and a U.S. Lamar Hunt Open Cup. Donovan had a great career playing for the US soccer team as well, he leads as the player with the most goals (57) and assists (58) and is the only American player to surpass both 50 goals and assists in his career. Donovan’s 157 appearances are second-most all time in U.S. history. In June of 2008, he became the fastest American to ever earn 100 caps for the United States and the fourth fastest player in history to play in 100 matches for his country. Donovan has been named U.S. Soccer Athlete of the Year a record four times – in 2003, 2004, 2009, and 2010. He has won the Golden Boot in 2008. Donovan has also on the MLS All Star MVP twice in 2001 and 2014. He is a four-time winner of the U.S Soccer Athlete of the Year award – the only man to do so and the first man to win in consecutive years. He holds the record for being the only seven-time winner of the Honda Player of the Year award. He was awarded the Best Young Player award at the 2002 FIFA World Cup.